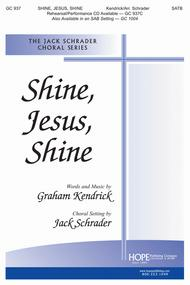 Shine, Jesus, Shine composed by Graham Kendrick. Arranged by Jack Schrader. For SATB choir. Contemporary, Praise & Worship, General, Sacred. Octavo. Published by Hope Publishing Company (HP.GC937).Graham Kendrick's immensely popular worship song, a top-seller in SATB voicing, is now available for SAB choirs.